The medical model, as well-intentioned as it may (or may not) be, holds the belief that Asperger’s/autism is a defect, a neurodevelopmental disorder. The problem with that line of thinking is that it requires the assumption that there is one “right” way to be, and that everything else, everyone who doesn’t fit into that “ideal”, is somehow wrong. And the problem with that premise is that, whether the “expert” authorities realize it or not, their ideal “correct” way of being is actually set rather arbitrarily. Who “passes” their set of standards? If someone doesn’t fit their mould, could there be a legitimate reason? As a result, we’re branded with a lifelong pathology, and we’re treated differently (less). We’re marginalized. All because of, to put it simplistically, one word: “disorder”. I’d like to introduce an alternative term, or at least some possibilities: (neurodevelopmental) “phenomenon”. Or, perhaps “neurological variant” (as I tweeted), or “neurological variance” (as Rhi wrote about in her excellent semi-viral post), or maybe even a “neurological orientation” (as I wrote about in a recent post). Because to continue to call Asperger’s/autism a “disorder” only reinforces the (false) idea that we are, by our very nature, somehow “broken” or, as this post is titled, “defective”. If there’s one thing we’re not, it’s “defective”. We, the people on the Asperger’s/autism spectrum, are every bit as expressive, talented, intelligent, kind, and affectionate as anyone else. We may simply have our own ways of doing it. I’ve noticed that we have our own ways of showing love and support, offering a listening ear, viewing the world, solving problems, expressing ourselves, describing what we’re thinking or how we’re feeling, forming friendships, engaging in hugs or other touch, hanging out, and so on. Just because we may have a different way of doing these things, doesn’t mean we don’t do these things! And it doesn’t mean we don’t do them well (in fact, we often do them very well). That’s not to say that some of these activities always come easily for us. For example, processing what we’re reading or hearing, choosing the right words with which to respond, selecting accurately-representative emojis (if applicable), etc, may take some extra time, or may not happen quite as efficiently. But remember, there are no extra points for speed, especially in the online world, where people log in and out of various websites or email accounts, and may not respond until a few hours later. By interacting online, we have more time to collect our thoughts and choose our words. And sometimes, these activities can be challenging. But that doesn’t mean we’re incapable. Consider, for a moment, the amazing bonds formed on social media sites like Twitter and Facebook, and also the bonds formed among blog-writers right here on WordPress. We find Like Minds (that “hive mind” post is coming soon, I promise!). We find Kindred Spirits. We find “Soul Siblings“. Have you noticed that when people on the Asperger’s/autism spectrum interact with each other, introverts suddenly become more outgoing and–eeek!–social?? Have you noticed that people on the spectrum who perhaps may not enjoy hugs in real life, send each other virtual hugs, virtual kisses, and heart emojis back and forth in online conversations? Have you noticed that when talking with each other, we Aspergian/autistic people actually seem to feel less socially awkward? And what’s more is, that we actually seem to understand each other on an intuitive level? How can this be? After all, we’re supposed to “lack empathy”, right? This includes “cognitive empathy”, a concept defined as the ability to understand another person’s line of thinking, putting ourselves in their minds and attempting to see their point of view. And yet…the “error rate of understanding” (my term; i.e., the frequency that we feel misunderstood) while interacting with each other appears to be no different from (no greater than) that of two neurotypical people in run-of-the-mill conversation. In other words, interacting with people of our own/same neurotype (i.e., other Aspergian/autistic people) appears to erase a lot of the social awkwardness we otherwise feel and “normalize” our ability to understand and be understood! …reduce the prevalence and/or effect of the ASD Holy Trinity: The “Triad of Impairments”. We simply have a different operating system (OS), that’s all. Certain lobes of our brains are shaped differently. Certain brain lobes are also connected differently. Our brains (and their lobes) likely function differently. But I insist that it’s Different, Not Less. When you put an Apple/Mac and a Windows/PC side by side, they run differently. They have different hardware components, connected and wired together differently, and the OSs themselves are built on entirely different coding languages. The world is geared for Windows/PC. For a while, that platform controlled almost the entire computer market. There are more software packages/apps available for Windows/PC. Files in Windows/PC formats are sent and shared back and forth all the time, assuming that you do–and implying that you should–have a Windows/PC machine capable of reading those files. For the longest time, Apple/Mac was mocked and derided, because it was different. People who had Apple/Mac systems were historically perceived to be “weird”. The Apple/Mac users historically felt fairly limited in how they could use their systems, because hardly any software existed for Mac, as compared to Windows. This is because Windows/PC is (was) considered The Standard. The world is geared for Windows/PC neurotypical people. For a while, that platform controlled almost the entire computer market population. There are more software packages/apps supports, social norms/customs, and even opportunities available for Windows/PC neurotypical people. Files communication/messages in Windows/PC neurotypical formats are sent and shared back and forth all the time, assuming that you do–and implying that you should–have a Windows/PC neurotypical machine (brain) capable of reading those files messages. For the longest time, Apple/Mac Asperger’s/autism was mocked and derided, because it was different. People who had Apple/Mac Aspergian/autistic systems were historically perceived to be “weird”. The Apple/Mac users Aspergian/autistic people historically felt fairly limited in how they could use their systems, because hardly any software supports, social norms/customs, and even opportunities existed for Apple/Mac Aspergian/autistic people, as compared to Windows/PC neurotypical people. This is because Windows/PC neurotypical people are (have been) considered The Standard. The world is geared for neurotypical people. For a while, that platform controlled almost the entire population. There are more supports, social norms/customs, and even opportunities available for neurotypical people. Communication/messages in neurotypical formats are sent and shared back and forth all the time, assuming that you do–and implying that you should–have a neurotypical brain capable of reading those messages. For the longest time, Asperger’s/autism was mocked and derided, because it was different. People who had Aspergian/autistic systems were historically perceived to be “weird”. The Aspergian/autistic people historically felt fairly limited in how they could use their systems, because hardly any supports, social norms/customs, and even opportunities existed for Aspergian/autistic people, as compared to neurotypical people. This is because neurotypical people are (have been) considered The Standard. But do we say that Apple/Mac systems are defective? Nope (well, OK–some Windows/PC-biased smart-arses might say they are, but only facetiously). In truth, there is no “right” OS; historically, if you had a different system, and did not have a Windows/PC-based system on hand, you were at a serious disadvantage. These days, there is more “operating system diversity”, in which more people have adopted Apple/Mac or Unix/Linux systems, and these are all accepted. Windows/PC no longer has the dominating stronghold on the entire market, and many file formats are universally recognized across multiple platforms (and, more “converter” apps exist to convert one file format into another). But nobody is mocked or considered “wrong” for having an alternative system. Whoa. Now take that paragraph and make similar neurotype-related vocabulary substitutions (don’t worry, I won’t bore you with the written-out exercise again 🙂 ). But seriously, what if we could write the above paragraph to pertain to the spectrum/non-spectrum analogy?? That’s what we’re moving toward, and that’s the whole point of this post. We, the people on the Asperger’s/autism spectrum, with the “Apple/Mac OS” are not defective. Our systems work just fine. And in fact, when connected with each other, we share information, ideas, messages, etc, back and forth all the time, with a very low “error rate” (i.e., misunderstanding). We “function” a lot easier, with fewer “bugs”. Interacting with each other is a lot less exhausting than trying to interact with someone of a different neurotype (i.e., neurotypical people). We express ourselves easier, and the whole “file” (message) tends to come through, with its proper/accurate context (which would otherwise often get “garbled” the way computer files do when they haven’t been converted/read by another program well). That’s right. There is no “right” way to be. In a world full of neurotypical people, where they have–due to a simple case of statistical odds in which they’re the overwhelming majority–written the rules largely for themselves, being part of the 1% of the population that’s on the spectrum can indeed feel like a defect. I had always thought I was defective. 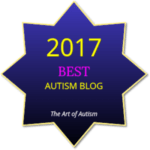 I had never met any Aspergian/autistic people, so everyone I had been surrounded by was neurotypical; of course I was going to feel “wrong”–I had no one of my same type to compare “note” with! …and just how “normal”, even if it’s a different kind of normal, (i.e., “legit”), that I actually am. Considering the fact that the vast majority of the population are NT, and I have to interact with them whether I like it or not, I am always going to be defective and have problems that NT’s simply do not have. I am virtually blind where they are concerned and a huge amount of the problems I have with people stems precisely from that blindness. Animals are very open about how they feel and they let you know in a very simple and easy to understand way, people most definitely do not. Secret looks, smiles, ways of looking, ways of behaving, mind games (which they play frequently) all oblivious to me. In their world I ‘am’ defective, there ‘is’ something wrong with me. There is nowhere else I can go and there isn’t a damn thing I can do to change any of it. What I love is just that thing where, in the Facebook group we’re in, we all generally get on well, so much better than I do in “normal” NT-biased communities. I have a very small, for Facebook, group of friends (95) in Facebook proper and often feel a bit overwhelmed by as many as I have and have an urge to drop a load just to keep things manageable for me. I’m obsessive about not missing a single post so the fewer people posting the better I can keep up. And to that end, I have constructed a peer group that all seem to accept my foibles as my eccentricity and generally don’t get too pissed off with me. I’ve also been a member of various photography groups but find I’m often misunderstood and misrepresented there which makes me drop into defense mode. In the end I drop out of Facebook groups because I can’t handle any more cognitive load. But the Aspie group is very different. Although people are people and disagreements and misunderstandings still occur, you would never believe that the members of that group all have a neurotype that is consistently described as “lacking social skills”. I was observing this quite a but and you hit the nail on the head too: when amongst our own tribe, we demonstrate we share a perfectly function set of social skills that just happen to differ from those expected from us by the majority of humans. Socially I’ve managed to get by with small groups of friends (no group larger than 4) who are always those few who are misfits in some way, in my case by neurotype, but in others it’s usually something that they don’t conform to society’s expectations and often are purplexed. I am able to be accepted among them because of a self-selecting tolerance, even preference for, eccentricity. But in the Aspie group I found a huge (1000+) group of people who will simply not usually jump to conclusions, not assume we’re lying, ask for clarification and accept clarification without being inexplicably aggrieved. We’re not defective, we’re just a different strain. And I’m loving discovering my tribe. I had to learn Twitter. When I first joined it used to stress me out trying to get back to the last tweet I’d seen so as not to miss anything. Eventually, and to protect my sanity, I taught myself to ignore stuff I hadn’t seen. It was quite a hurdle but I can now use Twitter. I prefer Facebook because it’s more intimate (get me: an Aspie who prefers intimacy! Alert the “experts”! 🙂 ) but Twitter is great for hearing more thoughts from more people without having to get to know each other. It’s a different thing, but I really had to get over the have-to-not-miss-anything hurdle before I could use it. I’m from the southern Georgian Bay area of Ontario, where we loved to sail in our little 27′ sailboat. My husband was born in Australia and we moved here in 2013.